Syllabus of the Online Course (Subject): European Union-Moldova Association Agreement. Learning materials in or Unión Europea-Moldavia Union européenne-Moldavie União Europeia-Moldávia. The EU-Moldova Association Agreement entered into force in 2016. 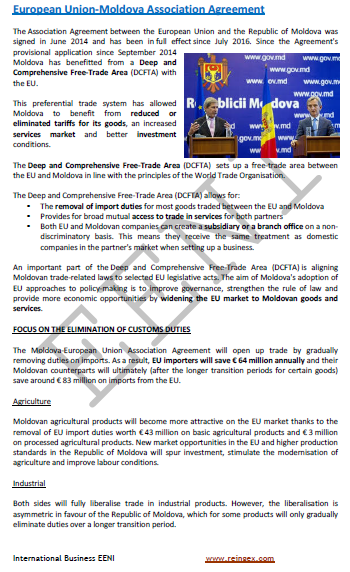 One of the objectives of the Association Agreement is the implantation of a Deep and Comprehensive Free-Trade Area between Moldova and the countries of the European Union (Austria, Belgium, Bulgaria, Croatia, Cyprus, Denmark, France, Slovakia, Slovenia, Spain, Estonia, Finland, Germany, Greece, Hungary, Ireland, Italy, Latvia, Lithuania, Luxembourg, Malta, the Netherlands, Poland, Portugal, the United Kingdom (BREXIT), the Czech Republic, Romania, and Sweden). Moldova is part of the European Neighbourhood Policy (Eastern Partnership). The European Union-Moldova Association Agreement belongs to the European Economic Area (Western Civilisation) and the Economic Area of Orthodox Civilisation.